"Tech-savvy" means something completely different today than it did 10 years ago. Today's new professionals aren't just searching job sites and emailing resumes; instead, “social” is their native habitat. They use social and professional networks to research companies, explore trends, and get the inside scoop on careers from classmates, friends and family. So in this dramatically changed environment, which companies have attracted the attention of today’s students and recent grads? To find out, we crunched LinkedIn data. Our results are based on their LinkedIn activity including job search behavior, the companies they follow, and their views of company pages and member profiles. • The Boston Consulting Group and Facebook have the most global appeal to students and recent graduates – either of them appear in every Top 10 country list except Brazil. • Brazil is the only country whose Top 10 list exclusively features domestic companies. • Students in the United States (US) are more likely to follow entertainment, media and social brands, while students in the United Kingdom are most interested in fashion and retail. • In India, students focused on companies headquartered in the US – along with IT and tech companies. • Energy and engineering companies topped the list for Aussie students. 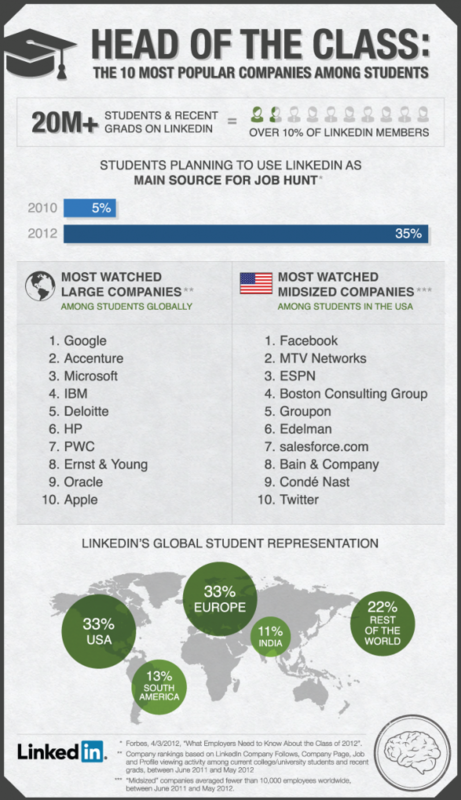 • German students want to work for consulting firms – and Red Bull! A recent survey** shows that more than 35% of students plan to use LinkedIn as a primary source for their job search – that’s a 700% increase since 2010. And our numbers back this up: students and recent graduates are the fastest growing demographic on LinkedIn, with more than 20 million* today from nearly 20,000 schools worldwide. Since “social” is the new “tech-savvy,” companies that build strong employment brands in the social streams where students swim will excel at attracting the next generation of top talent. So how can companies build their talent brand to attract, recruit and retain the new generation of top performers? 1. Post your entry-level jobs and internships for free on LinkedIn.com through June 2013. See here for details. If you have dozens of positions to post, contact us and we’ll help you. 2. Turn your new hires into recruiting ambassadors. Help them set up strong LinkedIn profiles that reflect your brand. Encourage them to share job openings in their college alumni groups on LinkedIn. 3. Launch a LinkedIn group for new graduates and interns. Use it to share career advice, insights on your company culture, and new opportunities. 4. Synchronize your online and offline efforts. Use LinkedIn Events to drive attendance; and include links to your group and LinkedIn Career Page in your email signature. For more advice on how to recruit your next generation of leaders on LinkedIn, download our student recruiting datasheet. 1. Where did last year’s class find jobs? Visit LinkedIn Alumni to see what alumni from your school are doing now. 2. Search for jobs and internships on our Student Jobs homepage. 3. Join your school's LinkedIn alumni group to meet people who can help with career advice and job opportunities.